Be able to determine the degree of a polynomial. Be able to classify a polynomial. Be able to write a polynomial in standard form. 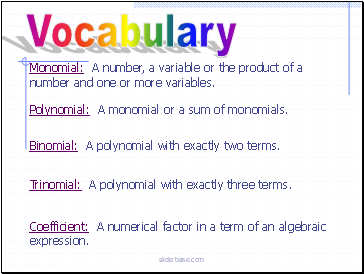 Monomial: A number, a variable or the product of a number and one or more variables. 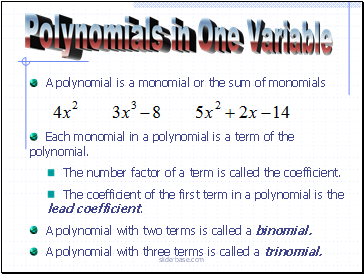 Polynomial: A monomial or a sum of monomials. Coefficient: A numerical factor in a term of an algebraic expression. 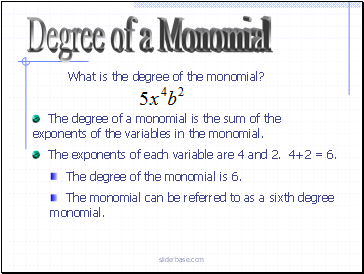 Degree of a monomial: The sum of the exponents of all of the variables in the monomial. Degree of a polynomial in one variable: The largest exponent of that variable. 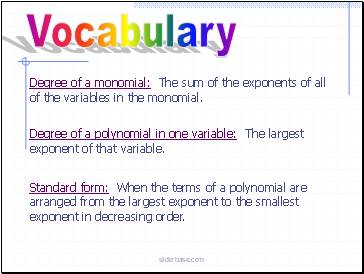 Standard form: When the terms of a polynomial are arranged from the largest exponent to the smallest exponent in decreasing order. What is the degree of the monomial? The degree of a monomial is the sum of the exponents of the variables in the monomial. The exponents of each variable are 4 and 2. 4+2 = 6. The degree of the monomial is 6. The monomial can be referred to as a sixth degree monomial. 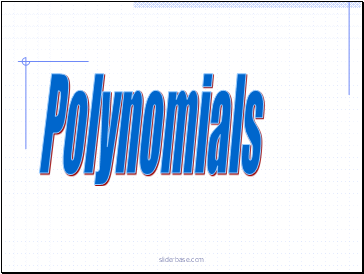 Each monomial in a polynomial is a term of the polynomial. The number factor of a term is called the coefficient. The coefficient of the first term in a polynomial is the lead coefficient. A polynomial with two terms is called a binomial. A polynomial with three terms is called a trinomial. The degree of a polynomial in one variable is the largest exponent of that variable. A constant has no variable. It is a 0 degree polynomial. This is a 1st degree polynomial. 1st degree polynomials are linear. This is a 2nd degree polynomial. 2nd degree polynomials are quadratic. This is a 3rd degree polynomial. 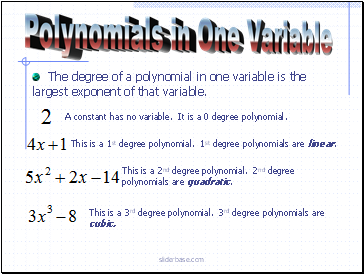 3rd degree polynomials are cubic. 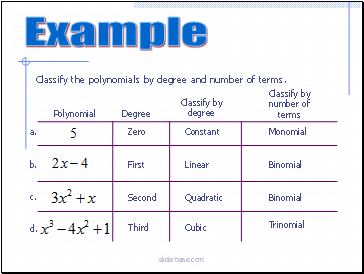 Classify the polynomials by degree and number of terms.